In 1919 W. S. Campbell, a Parramatta resident for many years, gave a wonderful talk to the Royal Australian Historical Society recounting his early memories of life on the Parramatta River in the mid-1800s. The account begins with his first trip up the river in early 1848 with his father Dr. F. Campbell who at this time was in charge of the Lunatic Asylum at 'Tarban Creek', a small community made up of a few houses scattered around the asylum. Most of these were occupied by officials and the little hamlet close to Parramatta contained no more than 20 houses. Between 'Tarban Creek' and lunatic asylum was 18 acres owned by Mr Thomas Stubbs, a well known Sydney auctioneer. This property was later purchased and the house enlarged by the Marist Brothers as a place where South Sea Missionaries would be able to recuperate after spending time in the Pacific. Some 200 yards or so from the Asylum buildings, a ferry plied across the Parramatta River, which was then known as the “Bedlam Ferry” and which connected the ends of the Great North Road. …Along the center of the river hereabouts, for a mile or so, large mud oysters, about the size of a cheese plate were dredged up from the bottom of the river by one or two fishermen. They were known as “mud oysters” and were sold in Sydney. They were very coarse and no one, I think, about the river ever made use of them. They are now either extinct of very scarce. Most of the country in the vicinity of the river was in its primeval state, or nearly so, in 1848 and for about five years afterwards, and was exceedingly beautiful. 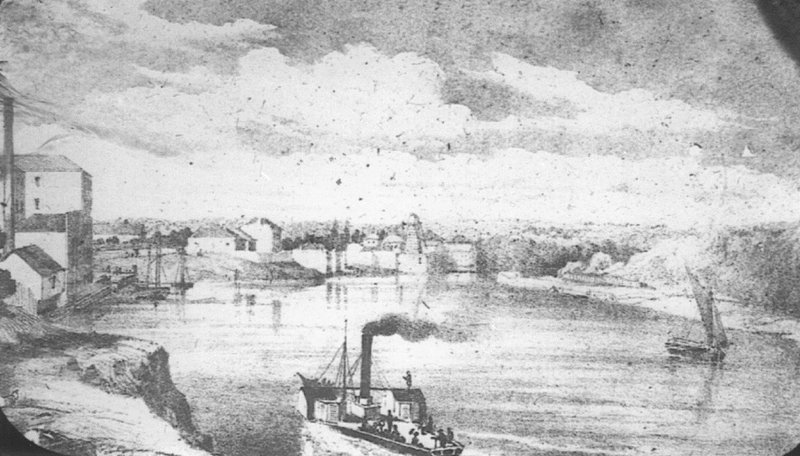 The only wharves where steamers went alongside, between the lower Parramatta wharf, known as “Redbank”, and Sydney, where Pennant Hills wharf and Kissing Point wharf. At Bedlam Ferry the steamers stopped in mid-stream, and passengers were taken to and from them by the punt man, who made a small charge. Two times a week considerable traffic could be seen along the river from early morning to late at night when orchardists from far and wide drove their fruit carts to be ferried to Sydney markets. The produce was then packed in gin cases or baskets and carried in a large number of sailing boats to the Sydney markets. Also plying their trade on the river were the large ballast boats which carried broken-up blue metal for Sydney streets from the quarries around Pennant Hills. He goes on the say that … Along the river bank to the wharf at the foot of George Street, Parramatta, Elizabeth Farm extended, and the only occupied place was Silas Sheather’s ‘Camelia Grove’ nursery where Sheather raised many excellent varieties of camellias. Later on camellia flowers, anemones,and ranunculus’s, chiefly, were sent from this nursery to Mr. Searl, florist, Sydney, who had a place of business in the Sydney Markets. These flowers were sent by steamer, tied in bunches to long pieces of wood, and were hung up about the decks. I think Mr. Searl was the first to start the business of a florist in Sydney. This was afterwards carried on by his sons in King Street. Along the water frontage of Elizabeth Farm were two wharves, one at “Redbank” and another opposite at “Subiaco” (Subeacca, as it was often termed). Here the steamers stopped according to the tide. If favourable, the steamer could pass to the George Street wharf, but if not the passengers had to land at one of the others. John McArthur’s old house was occupied by Mrs Allport, widow of the artist, when I went to Mr. Woolls’ school, Parramatta, in 1856-57, and I often accompanied Mr Woolls to the house and garden chiefly to see the fine collection of exotic planted collected by Macarthur. During this period boating was the activity more indulged in than any other activity for amusement or relaxation by those who lived in the vicinity. Australia Day, Jan 26, saw great numbers of persons collected about the foreshore of the harbour to witness something of the regatta … About this time of the season the old “Windsor” pear was ripe and was always looked forward to on anniversary day, it is never seen now unfortunately superseded by other varieties. This article by Campbell also gives us a wonderful insight into the natural beauty of the river and its wildlife … There were many beautiful, clean sandy beaches, now nearly all mud flats, where it was pleasant indeed to have a “Bogey”. (this is the Aboriginal word for a swim or dive then in general use). … the northern side of the river at time, especially when the season for gill birds, or “wattle birds” as they were sometimes called, came about. Then they appeared in their hundreds, and perhaps, thousands. There were always numbers visiting the bottle brush or honey-suckle trees for the honey of the flowers. Bronze wing pigeons were common. They used to build in the “tea-tree”, making rough nests with sticks. Fishing was excellent, there nearly always being an abundance of many kinds of fish in the river. Snapper weighing from 16 to 18 pounds were common, indeed nothing then was considered to be a snapper under 15 to 16 pounds weight. Red and black bream abounded, and the latter now considered to be a very shy fish, could be easily caught , even occasionally with a bent pin and bread for bait, the line being nothing but seaming twine.